The kids in Upside-Down Magic know their magic is a little out of control. But that doesn't make them weird -- it only makes them human. 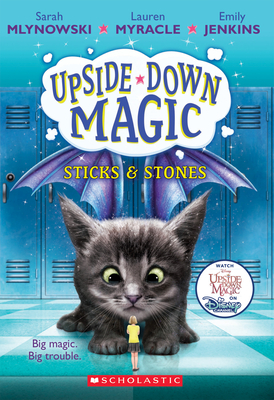 Strange things are happening at Dunwiddle Magic School and the Upside-Down Magic class is getting blamed! Yes, Marigold did shrink Lacey Clench to the size of a gerbil. But that was an accident. And, yes, most people weren't prepared for Nory to transform into a squippy (that's half squid, half puppy)-but it's not like Nory meant to mix up paws and tentacles. And while Bax does have the unfortunate magical condition of turning into a stone, he swears he has nothing to do with the rocky magic that's been happening in Dunwiddle's halls. When things get messy, it's easy to point your finger at the kids with the messiest magic. But the Upside-Down Magic students aren't going to let themselves get in trouble. Instead, they're going to find out what's really going on-and get their school back on track before something really wacky happens.